Astronaut photograph ISS055-E-70602 was acquired on May 13, 2018, with a Nikon D5 digital camera using a 70 millimeter lens and is provided by the ISS Crew Earth Observations Facility and the Earth Science and Remote Sensing Unit, Johnson Space Center. The image was taken by a member of the Expedition 55 crew. The image has been cropped and enhanced to improve contrast, and lens artifacts have been removed. The International Space Station Program supports the laboratory as part of the ISS National Lab to help astronauts take pictures of Earth that will be of the greatest value to scientists and the public, and to make those images freely available on the Internet. Additional images taken by astronauts and cosmonauts can be viewed at the NASA/JSC Gateway to Astronaut Photography of Earth. Caption by Andi Thomas, Hx5, JETS Contract at NASA-JSC. 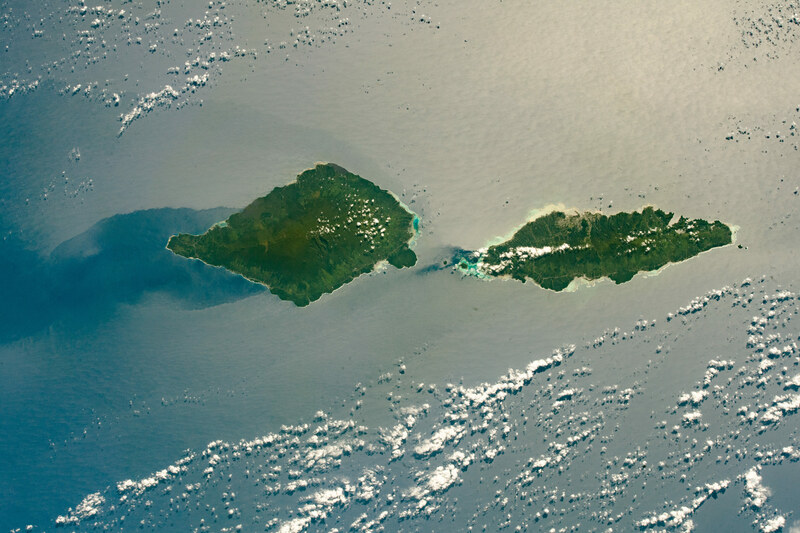 This photograph, taken from the International Space Station as it passed over the South Pacific Ocean, captures the two largest Samoan Islands as they were highlighted by the optical effect of sunglint. 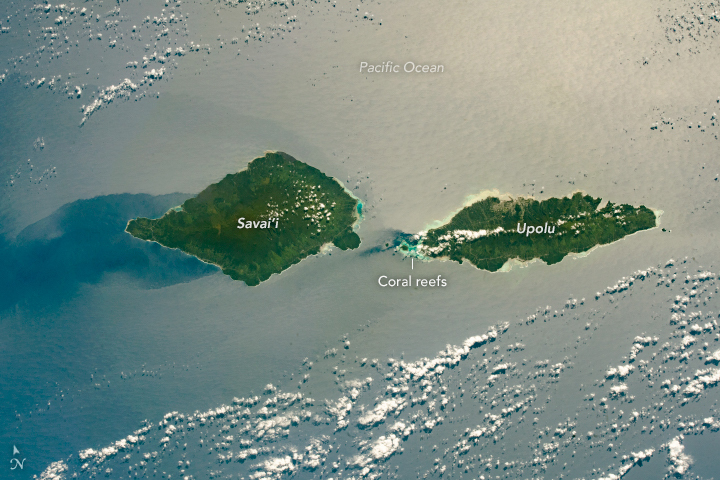 Savai‘i, the westernmost Samoan Island, is 80 kilometers (50 miles) long; Upolu is nearly as long (74 kilometers/46 miles). The dark green centers of the islands reflect the denser tropical forests and higher elevations in comparison to the lower, light-green coastal regions around the edges. The top of Mount Silisili, an active volcano, forms the center of Savai‘i and is the highest point at 1,858 meters (6,095 feet). Savai‘i’s elevation likely contributes to a wind shadow on the west side of the island; this shows up as a region with no sunglint, indicating a smooth water surface. Upolu’s highest point, Mount Fito, reaches 1,100 meters (3,608 feet). The narrow stretch of water separating the islands is known as Apolima Strait. Coral reef ecosystems surround the islands and appear as light-blue regions due to shallow water depths. (These are reminiscent of the waters surrounding the Bahamas.) While ferries and ships use the Apolima Strait for tourism and commerce, swimmers also sometimes race across the strait, which is about 22 kilometers (14 miles) wide. Both islands are volcanic in origin, with nutrient-rich basaltic soils that are good for farming. According to the 2015 Report by the Samoa Agriculture Survey, 97 percent of Samoan households grow crops; of these, 60 to 70 percent grow taro root or coconuts. Located on the north side of Upolu, Apia is the capital of Samoa and the center for export and commerce of these crops.